If you are a regular reader of the site, you will know of my love for Tarte, I've recently reviewed their Tartelette Palette, however as you can probably see from the below swatch picture (note I have remembered this time to label the shades) that this is a well loved palette for me. Apart from the occasional Nars palette or put your own MAC palette together, a good quality small travel eye shadow palette is very hard to come by. Well in my opinion it is. However all thanks to Tarte, look no further - I actually have two of their smaller palettes. The Tease palette was the first smaller palette to be released from Tarte and unlike their larger palettes which the formula can be hit and miss this isn't the case with Tease. It is worth noting that in my personal opinion, I've had no issues with the formula of my Tartelette shadows, however if you look at reviews online/youtube you will see that the reviews are all over the place. Apart from Nars shadows, hands down I have never ever used more buttery shadows. They're super pigmented and blend so easily on the eye. Go in with a fluffy blending brush for a wash of colour across the lid, or use a more denser brush for more colour impact. The swatches above are heavy swatches using a brush and these are the perfect neutral shades for every day. If I've been away with work this is the palette which I always take. Crush and Wink are my two favourite shades and I've hit pan on both. 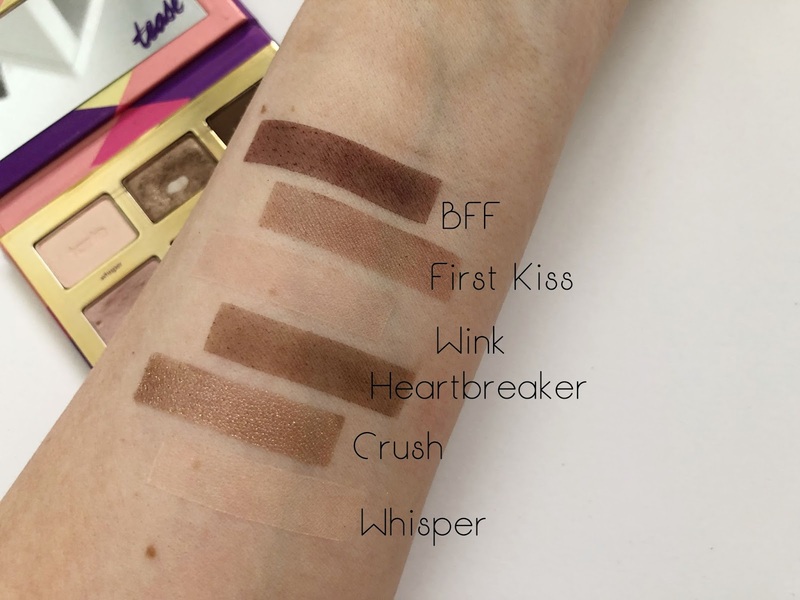 Tease provides a mixture of shimmer, satin and matte shades which can be used for a basic day look, however with the introduction of Heartbreaker and BFF you can easily have a dramatic eye look. The wearing power with these shadows without any primer or base is amazing and can last me a full day at work and a gym session, however normally I use Whisper to set any foundation/concealer I put on my eye lids before using - this is purely because I'm lazy and always apply too much product and can't be bothered to go and get a make up wipe. Since Urban Decay brought their Naked Heat and their Petite Heat palettes out, I have been tempted to to purchase the Petite Heat, however Tarte wasn't that late of the marker and ended up releasing their Flirt palette which has similar tones and hues to the Urban Decay palettes. If I'm honest this will probably be the palette I'll be asking Angela to bring me back from Florida later in the year. Are you a fan of Tarte eye shadows? I honestly think they need to start bringing single shades out, as I'd be all over that.